... I finally stopped to add up all of the money I had been spending on advertising my web site. Fifty dollars here, a hundred there; pretty soon it had become a substantial amount of money and I wasn't seeing much in return. On top of all that, I was pouring more than I care to even think about into Google and Yahoo ads.. That's why I created My Article Submitter! My Article Submitter is the Fastest and Easiest way to get your articles posted on hundreds of article directories without spending hours and hours on the manual labor of doing so! 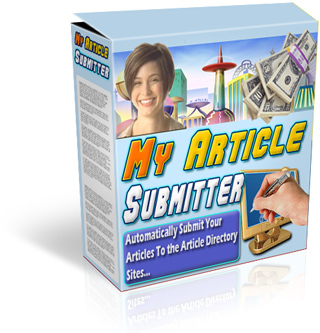 Use My Article Submitter and your articles to establish yourself as an expert in your particular area. Use My Article Submitter and your articles to make more sales. Use My Article Submitter and your articles to generate more traffic. Use My Article Submitter and your articles to increase your Google Page Rank. Use My Article Submitter and your articles to boost your Alexa rating. My Article Submitter has 138 Auto Fill article directories for you to start posting your articles to! It also has an additional 25 Manual fill articles directory sites as well. We have 163 Directory sites already loaded in but you are welcome to load in as many more as you wish, also don't be fooled by other Article Submitting Software that claims to have more than 500 sites to list your articles to! These are SPAM MACHINES, that will have you looking like a fool in no time flat! They will have you submitting articles where they are not wanted and many of them even post a link back to their software right in your articles that you submit. My Article Submitter does not just allow you to load in 500 articles and hit a button a forget it. Any software that promises this is doing nothing more then spamming your articles all over the Net. My Article Submitter software stores all of your personal information, resource box, and articles. It then will proceed one at a time to go to each of the articles sites for you, log you in and auto fill all of your content including your name, your article, your author resource box, even an article summery on any sites that ask for it!